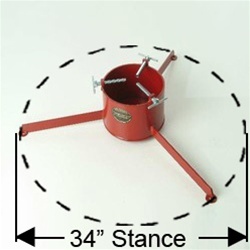 Christmas Tree Stands | 8XTS | Free Shipping! This tree stand will hold trees 9 feet tall with a 6" maximum diameter trunk. It weighs 20 pounds and has a 1.2 gallon water reservoir! Real Tree Maximum Trunk Diameter: 6"
Need a mat for this stand? The Drymate is designed to soak up spills before they get to your floor. SHIPPING NOTES: Overnight, 2nd Day & 3rd Day shipping options are available in your shopping cart when you order online. Free Ground shipping for contiguous United States (lower 48 states) only. Sorry, we do not ship outside the contiguous United States (lower 48 states). Express shipments may take longer than expected, particularly during the holidays. Please understand that weather and the time of day your order is placed can have an effect on when you actually receive your order. Note: While we try to process orders with Standard Overnight, 2Day & Express 3Day Saver shipping requests the same day we receive them,it may occasionally take up to 2 business days to process your order.Please review all shipping fees on the last page before you enter your credit card number and process your order.